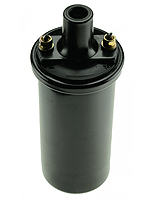 If your coil is mounted on top of your distributor, you can use this adaptor kit, to mount a regular style coil. Flathead V8 coil adaptor kit with condenser. Fits distributors with the 3 Screw Coil fixing. Fits distributors with the 2 Screw Coil fixing. Ignition coil mounting bracket, in black finish. Ideal, if you are using the flathead V8 distributor coil adaptor kit, or simply relocating your coil to an engine mounted location. when using points or electronic ignition. Primary resistance 1.8 - 1.9 ohms. Use this one if you have NO ballast resistor in the system. High performance 0.6 ohm Flame Thrower II Pertronix ignition coil. Use this one for the standard 6v flathead V8 engine when the original points and ballast resistor is fitted. (Can also used on 12v when using the Pertronix Ignitor II electronic module). High performance 3 Ohm Flame Thrower Pertronix ignition coil. This is a high performance 3 ohm coil to use, if you have upgraded to 12v. (That's if you have one). To test, If you have a good 12v supply at the battery and also at the coil, then you have no ballast resistor in the system. Standard 6V Coil for the 1928-55 Fords when using points ignition. Standard 3 ohm Coil for the 1928-55 Fords. This is a standard 12v coil you can use, if you have upgraded to 12v and are still using points and condenser. Use this one, if you don't have a ballast resistor in the ignition system. To test, If you have 12v at the battery and also at the coil, (when the ignition points are closed), you have no ballast resistor in the system. If you find that the voltage has been reduced to 5 or 6 volts, you have a ballast resistor in the system and will need our A-12000-12BAL ballast coil. 12V ballast style Coil for the 1928-55 Fords. This is a standard 12v ballast 1.7 ohm coil you can use if you have a regular ballast resistor in your wiring system. If you find that the voltage has been reduced to 5 or 6 volts, you have a ballast resistor in the system and need to use this coil. Primary resistance: 1.7 ohms Secondary: 5800 ohms. Coil Bracket 1928-34. For mounting the ignition coil. Made in USA. Original style 6v ignition coil for the 1937 - 1941 Ford flathead V8. Mounts with 2 screws, on top of the distributor. Original style 6v ignition coil for the 1942 - 1948 Ford flathead V8. Mounts seperately away from the distributor.